ITEM #4022: WAHL ROSEWOOD ROLLER CLIP OVERSIZED PEN. Gorgeous WAHL #6 Broad Stub nib,re-tipped and ground by Greg Minuskin. No brassing or cracks on the pen. 5 1/8" long with cap screwed on X .599 dia @ cap band. Tests @ 1.5 cc capacity. Gold Filled trim, three bands on cap. Lever filler. Nib photos (last two photos on this listing) were taken by Greg Minuskin. ITEM #3251: EVERSHARP SKYLINE MODEL 76 (SHORTER SIZE) FOUNTAIN PEN WITH WET NOODLE SUPER FLEXIBLE 14K NIB. The width of the nib, on a Parker factory nib grader, is close to the border between Broad and Medium. The pen barrel is grey. The cap has a gold filled overlay and derby with no dents. Lever filling; no personalized imprints. ITEM #FILL TUBES BY FOOT: FLEIBLE FILL TUBES FITTING VACUMATIC, SKYLINE AND 5th AVENUE FEEDS. Order it by the foot. I find that holes in the backs of feeds vary from feed to feed; if you need to make this tubing thinner, hold it over a heat source and stretch it and it will get thinner. You can then cut it at the desired diameter. 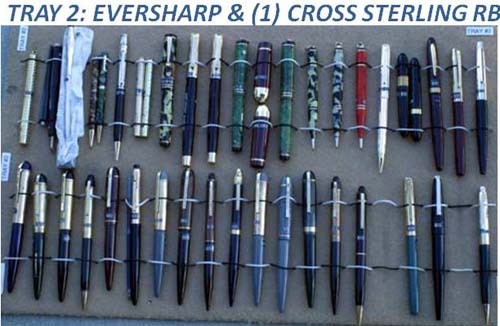 ITEM #VENTURA FEED: FEEDS FOR EVERSHARP VENTURA. .202" DIAMETER. These are for the Ventura, NOT the Slim Ventura. ITEM #3745: EVERSHARP SLIM VENTURA IN GREY. Broad 14K cursive italic nib and Aerometric (squeeze) filling unit. This pen is unused and its condition reflects this. ITEM #5404: EVERSHARP / PARKER BIG E, MEDIUM, BLACK, NOS W/ CHALKMARK. This has the Eversharp BIG E on the clip, it has "Eversharp" scribed on the front of the cap lip, and it has the Parker Arrow/elipse on the back of the cap. From the day that Parker had just bought Eversharp and was experimenting with the easiy removable nib that looks a lot like a 45 nib/feed unit. Has original chalk mark and a medium nib and includes a piston filling unit. ITEM #5405: EVERSHARP / PARKER BIG E, FINE NIB, BLUE, NOS W/ CHALKMARK. This has the Eversharp BIG E on the clip, it has "Eversharp" scribed on the front of the cap lip, and it has the Parker Arrow/elipse on the back of the cap. From the day that Parker had just bought Eversharp and was experimenting with the easiy removable nib that looks a lot like a 45 nib/feed unit. Has original chalk mark and a Fine nib and includes a piston filling unit. ITEM #5359: 'GENUINE' EVERSHARP CORONET PENCIL, HALF PLASTIC MODEL, BLACK/CHROME. Very strong imprint. Uses .046" leads. Has small ding next to clip. ITEM #4488:1939 EVERSHARP CORONET REPEATING PENCIL IN BLACK WITH RHODIUM TOP AND TRIM. No brassing. Near mint condition. Uses .046" leads. ITEM #4496: 1946 CAPILARY ACTION (CA) BALLPOINT. Maroon regular size (not Demi). Original condition - not fitted with a modern refill - it still has the original (later, non-spiral) refill which, of course, no longer writes. ITEM #4392: EVERSHARP 1948-54 SMALLBALL RETRACTABLE PEN W/ CLICKER ON TOP TO EXTEND THE POINT AND CLIP BUTTON AT TOP OF CLIP TO RETRACT THE POINT. Black with gold filled cap & clip.It comes with both a new, working replacement filler as well as the original Eversharp long Kimberly KEC-55 filler. ITEM #4425: EVERSHARP "ASTRONAUT STYLE" PEN. This is eversharp's answer to the Fisher Space Pen, using an Eversharp Kimberly with a sealed, pressurized filler, "the same style pressurized refill that has made many smooth trips into outer space and the moon". With box, this pen still writes and is ready for your next commercial space tourist trip. Near mint condition, with box, sleve, and papers. The (covered) spring on the box lid has popped off but is included. ITEM #4319: BOX OF RED TOP EVERSHARP LEADS. In metal boxes. Has 9 of the original 12 metal lead boxes inside with 2 similarly sized metal boxes substituted. .046" (1 mm). These are round leads, not the usual square Eversharp leads. 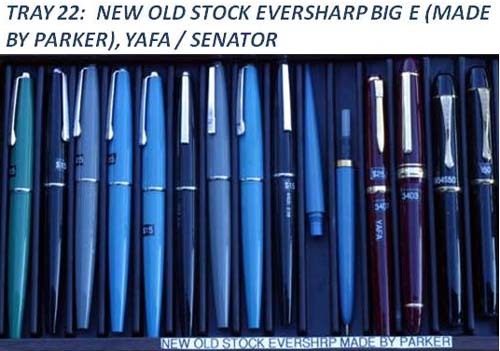 ITEM #2738: PARKER EVERSHARP 10.000 PEN, NEW OLD STOCK. This model was designed by Eversharp, pre-Parker purchase, one of the first products put out by the Eversharp division of Parker in 1958 right after Parker bought Eversharp. It was produced from 1958 to 1964 and was a tool in the development cycle of the 45. With a FINE steel nib and a cartridge filling capability, it has the Eversharp "E" on the clip and the Parker Halo insignia on the back of the cap. Never inked. This item cannot be returned if dipped or filled. ITEM #4121-4114: EVERSHARP KIMBERLY IN BLACK. An early ballpoint. This is a compact, fold-out version of a ballpoint design as shown in the photos below. It converts from a 3 1/2" unit to a regular sized 5" hand-fitting ballpoint. It could be stashed in a purse or a vest pocket. The original filler, included, is long since dried-out but is included for authenticity. It could easily be replaced with one of many available modern day fillers if they are cut down. ITEM #3873: EVERSHARP GOLD SEAL RINGTOP IN JADE GREEN. 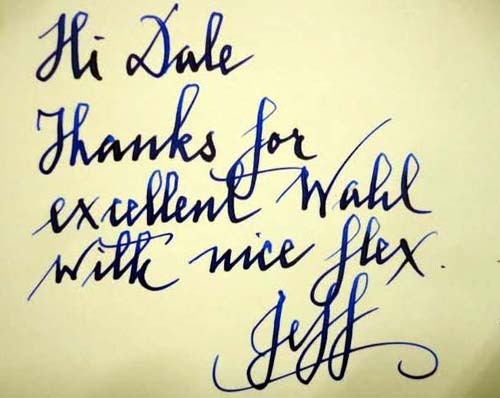 With fine Wahl Eversharp GOLD SEAL MANIFOLD nib. Fairly bright, even color with minor darkening at barrel threads and center of cap. 4 7/8" long, .510" dia. @ cap band. ITEM #3518: AN EXTREMELY CLEAN GOLD FILLED EVERSHARP SET.strong> THE METAL HAS NO DINGS OR DENTS, THE SECTION IS MAROON, AND THE PENCIL IS A CAP ACTUATED PUSHER TYPE. THE 14K NIB IS FINE AT .025” AT THE TIP. AEROMETRIC TYPE FILLING UNIT. THE BOX IS VERY CLEAN ALSO AND IS MARKED “24-40” ON THE BOTTOM. ITEM #5359: EVERSHARP CORONET PENCIL. Half plastic model, black and chrome. Uses .046" ( 1.1 mm) leads. ITEM #4359: EVERSHARP SYMPHONY REPEATER PENCIL IN GREEN WITH CHROME-GOLD BANDED CAP, ca 1948-49. Excellent condition with no dents / dings / scratches or brassing. ITEM #3744: EVERSHARP SLIM VENTURA IN BURGUNDY. Fine 14K nib and Aerometric (squeeze) filling unit. This pen is unused and its condition reflects this. ITEM #4291: PARKER EVERSHARP BIG E DEMONSTRATOR, NEW OLD STOCK. The BIG E was produced from 1961 through 1964 by the Eversharp division of Parker. It was one of many models used to evolve toward the 45. I haven't been able to find any mention of a demonstrator version of the BIG E in the literature, but here's a new old stock example that came with the inventory of a pen repair shop I bought. With a FINE steel nib and a cartridge filling capability, it has the Eversharp "E" on the clip and the Parker Halo insignia on the back of the cap. Never inked. This item cannot be returned if dipped or filled. ITEM #POINT OF SALE: EVERSHARP STAR REPORTER BALLPOINT REFILL COUNTERTOP DISPLAY, WITH REFILLS. Of course these new unused refills dried out decades ago without ever being used. Still, there are one dozen "Extra Long Kimberly Refill Cartridges" in individual envelopes in a neat fold-out cardboard display, plus the outer box that the whole thing came in. Refills are plastic, .157" dia., 4.6" long not counting the tip, and 4.8" long with the tip. THE NEXT 5 SKYLINES ON THIS PAGE STARTED OUT WITH ALREADY FLEXIBLE MIBS; THOSE FLEXIBLE NIBS WERE HANDED OVER TO MIKE MASUYAMA (MIKE IT WORK) WHO CONVERTED THEM TO WET NOODLES AS FAR AS FLEXIBILITY GOES. ITEM #5232: EVERSHARP SKYLINE WITH EXTRA TOP CAP BAND AND 'WET NOODLE' CUSTOM NIB. This is a Skline configuration that Syd tells me wasn't in a catalog but DID show up in a flyer. They are pretty hard to find. It has an extra top band on the cap. The nib was customized by Mike Masuyama (Mike It Work) from an already flexible Skyline nib to a fine super flexible wet noodle. ITEM #4298: EARLY EVERSHARP 5th AVENUE BALLPOINT. This pen has a modern, working ballpoint filler in it, so unlike most ballpoints of this vintage, it works. Black with gold filled cap. This appears to be made from the barrel and cap used on the fountain pen with a newly designed aluminum black anodized front end to accommodate a ballpoint filler.This was made by Eversharp as a ballpoint and has been recently converted to use a modern day filler. No dents or brassing in/on the metal. ITEM #4371: PARKER / EVERSHARP POST-BUYOUT ca. 1959 ALTERNATE TO THE JOTTER (BALLPOINT). Sure looks like a jotter. I can't find a model name for this one; it has an Eversharp Big E on the top of the clip and a clicke. And it has the Parker logo on the back bottom of the cap and it uses a parker refill. It also has the metal tip on the barrel like the later jotters, but the cap/barrel joint uses course threads, also like the later jotters. Dark blue with a chrome cap & trim. The cap has a corduroy metal pattern reminiscent of the early jotter barrels. I think this is an evolutionary ballpoint. New Old Stock. ITEM #4367: EVERSHARP DESK SET SOCKETS, A MATCHED PAIR IN BURGUNDY/BROWN. With threaded brass inserts on the bottoms to screw onto swivels. No cracks, scratches, or brassing. ITEM #4978: EVERSHARP SKYLINE WET NOODLE SUPER FLEX in GREEN/GOLD WITH MEDIUM, FLEXIBLE NIB. Model 77 - This's what we think of as the standard sized one, between the Executive and the model 76. GREEN with gold filled overlay on the cap and gold filled trim. This is fitted with an "Eversharp 14K" Skyline nib that was fairly flexible has been modified by MIKE IT WORK (Mike Masuyama) . He has ground it to XXFine + adjusted it for added flow and flex. No brassing or dents in the body of the pen. Checkthe line width variation below. And I apoligize for my hand writing. Think of what a good hand could do with this nib. ITEM #5146: RINGTOP WAHL PEN IN BCHR. Crisp, glossy chasing and imprint. Medium 14K Wahl nib. Gold filled trim with no brassing. ITEM #5134: WAHL PEN GOLD FILLED FOUNTAIN PEN IN GOTHIC PATTERN. Large #4 nib measures out between Medium and Fine on a Parker factory nib gage. No dents or brassing on the metal. Lever filling. ITEM #5138: WAHL OXFORD FOUNTAIN PEN IN WILD COLORS. Brown, gold, and red marble pattern with gold filled trim with a 14K Wahl Oxford nib that is around the boundary of Broad / Medium width on a Parker factory nib gage. No crystalization on the ends. The plastic is in perfect condition. ITEM #4985: EVERSHARP SKYLINE WITH MEDIUM/FINE, FLEXIBLE NIB. Model 77 - That's what we think of as the standard sized one, between the Executive and the model 76. green with striped cap and gold filled trim. 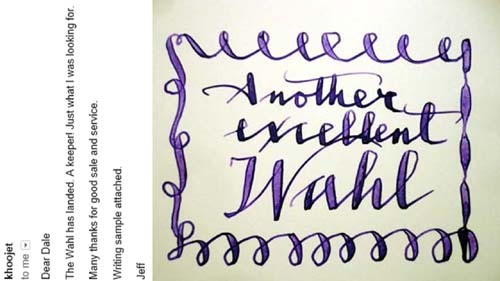 This is fitted with an "Eversharp 14K FLEXIBLE" nib. No brassing on trim. ITEM #4281: NEW OLD STOCK EVERSHARP / PARKER "TIP-WIC" EARLY CARTRIDGE FILLED FELT TIP. This was made by Parker right after the purchase of Eversharp. It has an "E" with a Parker arrow through it on the clip and the Parker Halo logo on the back-side of the cap. This is new and un-used with a chrome cap and clip. Its cap fits a Parker 45 and a 45 barrel fits its section assembly. Its section and feed bear stiking resemblances to those on a 45's. Comes with a black plastic barrel and section shell. Several available. ITEM #4888: EVERSHARP DORIC IN BROWN/GOLD EMBEDDED RIBBON PATTERN W/ No. 7 ADJUSTABLE NIB. Wide Deco band and gold filled trim. Plunger filler. No end crystallization or other known flaws. Gorgeous pen! The nib was gone over by Greg Minuskin. ITEM #4258: GOLD FILLED TINY No. 0 RINGTOP WAHL PEN. No dents, dings, brassing, or collapsed domes on this one with a FINE/MEDIUM No. 0 flexible nib. With un-used square cartouche (i.e., no personalization markings). Lever filling. ITEM #4306: WAHL-EVERSHARP CORAL RINGTOP PENCIL. Striking, non-faded color. Uses .046" leads. ITEM #4530: PLUM COLORED GOLD SEAL EVERSHARP. I'm not finding this one in the catalog. Extremely clean; very little, if any, wear. Medium 14K Eversharp nib. ITEM #4506: UNCOMMON SKYLINE 76. The 76 is the shortest of the three sizes of Skyline. This one is unique in that it has two bands at the top of the clip - most have only one. I found this in the Pen Haven inventory liquidation along with another just like it, two matching 76 pencils and a 77 fountain pen and pencil, all with matching double bands. Bert (of Pen Haven) thought it was a prototype as he hadn't seen this configuration before. Neither had the current owner of the Skyline manufacturing business (they are still making Skylines). I also showed it to a prominent Wahl / Eversharp pencil collector (you've possibly bought his book). He had ONE such pencil in his collection but had never seen another until I showed him these. This one is black and in like new condition. It has a Medium nib, slightly flexible. ITEM #4242: 12 SIDED GOLD SEAL DORIC IN GREEN STRIATED MARBLE. With Large MEDIUM width "Eversharp Semi Flex" nib. No brassing. No crystalization (or even the start of crystalization) in the end plugs of the barrel & cap. Crisp "WAHL EVERSHARP MADE IN USA" imprint on the back side of the cap. With .27" wide gold filled Deco band. This pen is in immaculate condition with a silicone sac to continue to preserve its bright color. Lever filling. ITEM #3796: SMALL WAHL GOLD FILLED RINGTOP PEN. Alternating square / vertical space pattern. No. 0 14K Wahl nib. No dents or dings. ITEM #4556: BLACK EVERSHARP PENCIL. Very clean w/ gold filled trim and double band. ITEM #1471: WAHL PEN, JADE GREEN RINGTOP. Has a mediun #2 WAHL nib and tests out at .8cc ink capacity, quite a bit for a pen this size. The color is very uniform, both in the barrel & cap with very minor darkening. No brassing. ITEM #4268: EVERSHARP BLACK HARD RUBER PENCIL WITH CRISP CHECKERBOARD CHASING PATTERN. Uses .046" (1.1 mm) leads. Beautiful condition with no dents or dings in the derby. Not a ringtop - this one has an early, factory installed, welded-on gold filled clip. ITEM #2775: WAHL EVERSHARP OVERSIZED GOLD SEAL WITH ROLLER CLIP IN ROSEWOOD WITH FINE TIP WAHL EVERSHARP GOLD SEAL SIGNATURE NIB. ITEM #ITEM #3788: WAHL EVERSHARP BLACK HARD RUBBER PATTERNED LEVER FILLER RING TOP FLAT TOP. Fat & stubby. Black hard rubber color is about 99%. Fine Eversharp 14K nib. ITEM #3789: WAHL EVERSHARP BLACK CHASED HARD RUBBER LEVER FILLING RING TOPWITH WIDE SOLID 14K BAND. Band is inscribed in very well done cursive with " To Mrs. Hall from her Students OCT. 29, 1919". Medium Wahl TEMPOINT #4 nib. ITEM #3676: RED CHASED HARD RUBBER WAHL PEN WITH FINE SIGNATURE 14K NIB. Lever Filling with crisp chasing. Hard to find color. 4 1/4" long with cap screwed-on, .485" dia @ cap band. ITEM #3876: EVERSHARP DORIC WITH ADJUSTABLE NIB in GREEN/BLACK/PEARL. No. 3 fine tip RARE adjustable nib. This pen is 4 1/2" long with the cap screwed on and .513" dia. at the Art Deco cap band.